Geothermal leader Energy Development Corporation (EDC) supports the government’s efforts to rehabilitate Boracay island and restore its natural resources through the Department of Environment and Natural Resources. Last August 13, 2018, the DENR entered into a Memorandum of Agreement with its corporate partners, including EDC, in its Central Office along Visayas Avenue in Quezon City. 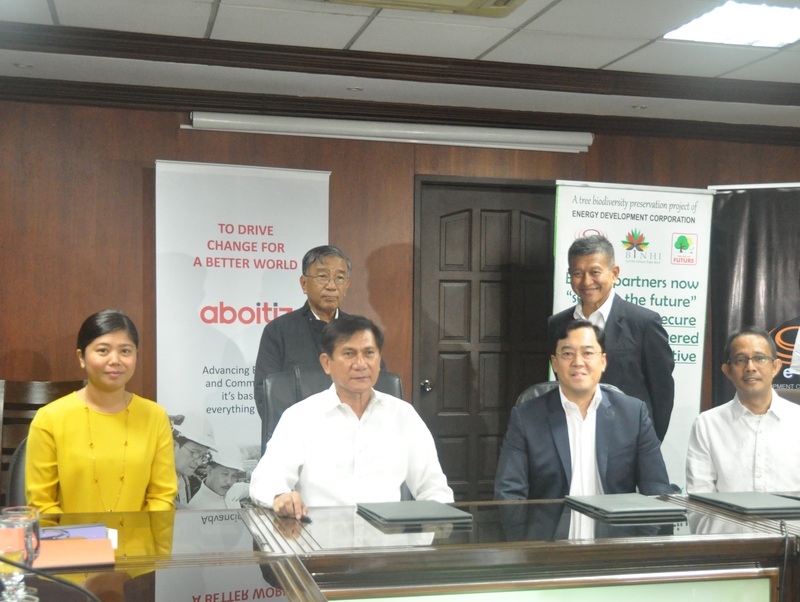 Under the agreement, EDC, through BINHI, its flagship environmental program, has committed to adopt wetland number 2, a 7.79-hectare area in Brgy. Balabag where only native trees will be planted and grown. Moreover, an arboretum of native trees will be put up. EDC plans to build an information center for visitors of the wetland and a bird watch platform to allow visitors to view the birds and bats that have been sighted in the area. These initiatives contribute to DENR’s various efforts to clean up and rehabilitate Boracay island, which has been closed to the public since April this year. EDC and DENR’s partnership for the wetland will run for 3 years. Under BINHI, EDC has undertaken the task of propagating 96 priority threatened native species. Foresters of the BINHI program have successfully located samples of these species in the wild. These samples were collected and are currently being propagated in EDC’s state-of-the-art automated nurseries in Antipolo and Negros Oriental. “The 96 native tree species have become increasingly rare, some were even last seen in 1911. Hence, they were believed to be already extinct. Through our BINHI team’s hard work, these 96 species were found, and we are now working towards propagating these. This partnership with the DENR is another way for us to increase the numbers of these tree species and restore the nature of Boracay,” EDC President and Chief Operating Officer Richard Tantoco said. Now on its tenth year, the BINHI program has reforested 9,196 hectares across EDC’s geothermal sites located in Leyte, Bicol, Negros Oriental, and North Cotabato. To help propagate these native tree species, BINHI now has 162 partners across 16 regions. EDC is the one of the world’s largest vertically integrated geothermal companies and the only diversified renewable energy firm in the country, with an installed total capacity of 1,456.8 MW of purely renewable energy. RESTORING BORACAY’S WETLANDS. Energy Development Corporation (EDC) supports the government’s initiative to restore the natural beauty of Boracay island. EDC and the Department of Environment and Natural Resources (DENR) entered into a Memorandum of Agreement (MOA), wherein EDC will adopt the 7.79 -hectare wetland no. 2, located in Brgy. Balabag. EDC, through its BINHI program, will plant native trees to enhance the biodiversity in the area and build a bird watch platform to allow visitors to appreciate the bats and various bird species of the wetland. Present during the MOA signing were (back row, from left) DENR Usec. Rodolfo Garcia, EDC Vice President Ferdinand Golez, (front row, from left): DENR Biodiversity Management Bureau Director Crisanta Marlene Rodriguez, DENR Sec. Roy Cimatu, EDC President and COO Richard Tantoco, and EDC Watershed and CSR Head Atty. Allan Barcena.